Dr. Manjushree R. Naik is a popular Cosmetic/Plastic Surgeon in Teynampet, Chennai. You can visit her at Aswene Soundra Hospital And Research Centre in Teynampet, Chennai. Don?t wait in a queue, book an instant appointment online with Dr. Manjushree R. Naik on Lybrate.com. 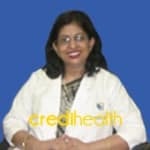 Lybrate.com has an excellent community of Cosmetic/Plastic Surgeons in India. You will find Cosmetic/Plastic Surgeons with more than 27 years of experience on Lybrate.com. You can find Cosmetic/Plastic Surgeons online in Chennai and from across India. View the profile of medical specialists and their reviews from other patients to make an informed decision. I'm 19 years old girl. My skin was getting dull and darker day by day. And all are asking why my skin was getting all these. Would you help me. What can I do to over come this? -apply de-tan lotion. -stay indoors or use sun protection. -keep sun screen handy and reapply after every 2 hrs when outdoors. -try to keep your skin covered in sun with cap, sun glasses/ cotton cloth, gloves etc. -cleanse your skin atleast twice a day nicely. -go fir regular skin cleansing or treatments to a good salon or dermatologist's clinic. -to de-tan, yogurt is considered very good, you may apply twice a day, for 15 minutes, then rinse. -take more vitamin c in your diet. Is there any medicine to increase skin complexion. Any tablets? Or any other way. Hello lybrate-user, avoid sun, if you go on sun apply sunskin lotions on face, wash your face when you come from out side, take fruits and fresh vegetables, avoid oil and junk food. I have prblm of hair falling and o have also a prblm of hair whitening soon please if you have any kind of solution den consult me. Everybody's cooperation is highly solicited. Hi. If you can follow some basic things then you will get better results in a short period of time, 1) drink only 100-150 ml of lukewarm water during meals, 2) don’t drink water before meal for one hour and one hour after meal, 3) avoid oily, spicy, junk, fermented and stale foods, 4) avoid late night sleeping habits, 5) avoid coffee and tea, A) take 30ml of BHRUNGARAJASAVAM and 30 ml of water and 1 TSF of jaggery after meals, B) apply equal quantity mixture of aloe vera juice and divya godhan ark of patanjali ayurveda in the roots of hairs…. Leave it for 30-45 minutes…. After that wash hairs with ROOTZ SHAMPOO (rajah ayurveda) three times in a week, do all things for 30 days. These things are much more effective, avoid use of any shampoo and hair oil…for 30 days…THANKS. I was totally depressed by stretch marks near axilla region and on abdomen laterally. I want to decrease them .what can I do. I am suffering from a problem of hair loss. please help to cure against this problem. For prevention of hair fall follow these instructions: • Do not take A lot of stress and take proper sleep of 6 - 7 hours. Do meditation to destress yourself. You can do Pranayams or take long deep breaths whlie closing your eyes I a peaceful environment for at least 8-10 minutes. • Add protein containing items in your foods for healthy hair growth such as take a bowl of cereal daily and a glass of milk or 100 gm cheese or 1-2 eggs.. • To reduce hairfall and whitening of hairs, Practice Yogasana like Shirshasana and Sarwangasana only under the guidance of Expert. • you can use mahabhringraj oil and apply it 3 times in a week massage your scalp for 10 to 15 minutes daily. It increases blood circulation in your scalp and enhances hair growth. * Avoid intake of any medicines because they cause toxicity & hairfall. • Avoid the excess use of products such as hair colours or shampoo. * Take Vitamin-E rich foods like dry fruits (Almonds, Pista etc) daily. * Take 1/2 teaspoon of Amla powder with water once a day. * Apply the egg yolk to the scalp atleast once a week. It gives nourishment to hair root and enhances hair growth. * Checkout your thyroid profile & take proper treatment of thyroid disorder. HI, I am a 13-year-old female who has blackheads on her nose and chin that has been there since I was twelve. Is there a natural remedy to convince them to leave? Mix 1-2 tablespoon of baking soda with the required quantity of water to form a smooth paste. Apply this pack on your nose and massage gently. Hello! I'm 19 years old and I have a problem of hairfall, my hair is becoming thinner day by day I'm just 19 now what after another 10 years! Please help me to make my hair stronger and thicker. Thank you. Take following oil 1. Vata-jatadi tail apply it on hair alternate days take following remedies 1 asthi poshak vati 1 tab before lunch and dinner 2. Amala juice 4 tsp + 2tsp sugar + 2tsp honey in the morning empty stomach 3. Laghu malini vasant ras vati 2 tab after lunch and dinner. I AM 31 YRS OLD , MALE, STAYING IN MUMBAI, INDIA, CLIMATE 30-35 DEGREE C. I AM HAVING PIMPLE SCARS BUT NO PIMPLES FROM LAST 2 YRS. I HAD 3 SESSIONS OF DARMAROLLER TREATMENT, BUT WAS NOT EFFECTIVE. SCARS LOOKS DEEP IN SUMMER. HAVE TRIED ALL SOLUTIONS LIKE LASER, CHEMICAL PEELS ETC.HAVE BEEN USING PHOTOBAN 30 SUNSCREEN GEL TOO. Hello Dear, Good medicine is available for black spotes/scars on face Tips ;-1. Stop or cut down the use of alcohol, tobacco, or illegal drugs .2. Drink lots of water. Avoid Smoking, Drinking. Spice Diet . I am 24 years old female. Since 7-8 months I have got lot of pimples on my face. My periods are regular. After trying with home remedies I finally went to a doctor who suggested me bengel 2.5%,doxol and cutishine. Out of which I got allergic to bengel and doxol. So he suggested for minoz od 100, papulex and emolene along with cutishine for 20 days. And I underwent metaisse treatment one sitting. The burning from bengel is reduced but the new pimples keep on popping out. Even after taking medicine on time please help. I have a skin problem called keloid. But one of the keloid on my body is different. I am not sure what is it. Treatment of keloid is injection of corticosteroids in the keloid. If corticosteroids failed to give relief, the keloid is to be excised by scalpel.